It’s an exciting time to be a Chinese food enthusiast in the United States. Gone are the days where the main options were fried rice and chicken lo mein from take out containers. There are now restaurants mastering the art of noodle making from start to finish, steaming perfectly juicy parcels of xiaolongbao (aka soup dumplings), and taking full advantage of local ingredients to make a hybrid cuisine that speaks to all of us. With changing waves of immigration from provinces like Sichuan, Shaanxi, and Fujian, we’re also seeing more specialized, regionally focused restaurants that have wrenched open the definition of what “Chinese” food can be here. In that spirit, here’s a list of the 25 best Chinese restaurants in the US that spans the range of new to vintage, haute to humble, and coastal to landlocked. There’s always good stuff happening at this low-key Chinatown eatery, where spicy beef noodle soup, braised eggplant, and xiaolongbao fly out of the kitchen in mere minutes. Of course, they have a fantastic selection of Taiwanese dishes, like soft oyster pancakes, fried pork chops over rice, real-deal stinky tofu, and braised pork buns with fermented mustard greens. Their diverse and uncompromising selection of tasty offal — duck tongues, pork blood, and kidneys — makes it seem like the whole restaurant was airlifted to Boston from Taipei. This Chicago stalwart is the grandpappy of serious Sichuanese restaurants in the US, having opened in 1998, a time when there still wasn’t too much mainstream interest in regional Chinese food. For many newbies, the chef’s specialty three chili chicken was their gateway drug; affectionately known as “chicken crack” among the regulars, the dish combines crispy fried chicken thigh pieces with jalapeño, dried red chilies, and Sichuan pepper. From there, they could graduate to the harder stuff: noodles with pork intestines, Chongqing-style dry chili chicken, and Szechuan spicy rabbit. To get something really Midwestern, try the chili fried smelt as well. 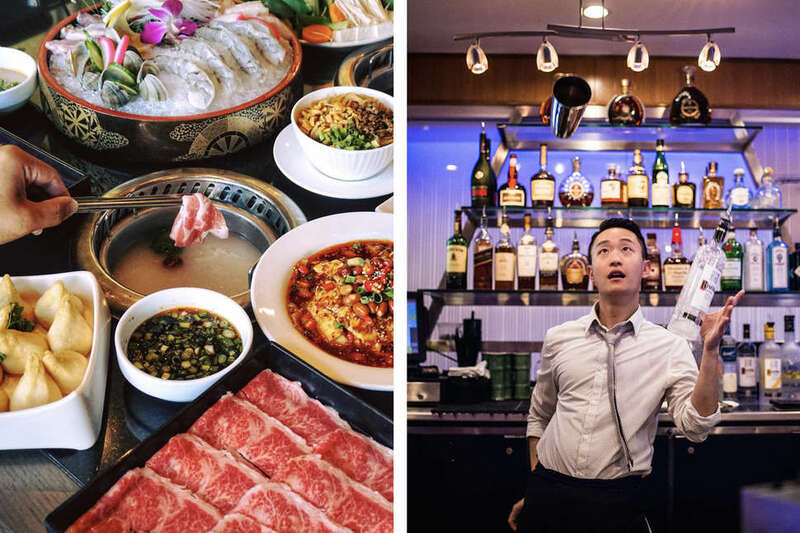 For years, Chengdu Taste has been named the best Sichuan restaurant in the country by publications like the Los Angeles Times and Serious Eats, and for good reason: the menu captures the hot, spicy, and numbing nature of the region like few else do. It’s tragic that one of the Eight Culinary Traditions of China has, so often, been reduced to “Cantonese dishes, but spicy” here in the US; but it’s no use crying over spilled chillies when you can just go here and weep with joy over their intense and elegant boiled fresh fish with green pepper sauce. Don’t miss their ma po tofu or toothpicked meat dishes, either. Pretty soon, Nom Wah will be celebrating their 100th birthday, which is a feat less likely than winning the lottery. They’ve been serving dim sum to Chinatown since way back when, but the dim sum classic really hit its stride when the original owner’s nephew took over, tightening up the interior and going from rolling carts to a la carte. Go for the turnip cakes with XO sauce, shrimp and snow pea leaf dumplings, and the rice noodle rolls. And of course, some of that good tea. At Sweet Home Cafe, the hot pot experience quickly becomes a delicious math exercise: With a dozen of broth types, 15 homemade sauce options, and 100 dunkable ingredients on offer, how many visits would it take to eat every possible permutation? The really fun part of eating here is picking out your ingredients; unlike at other hot pot spots, you look for them yourself in the many supermarket-style coolers and freezers in the restaurant, with color-coded plates signaling the prices for each item. To seal the deal, Sweet Home also provides a showstopping complimentary Taiwanese shave ice, topped with the jellies, tapioca pearls, and syrups du jour. The opening of Sichuan Impression, along with its contemporary Chengdu Taste, signaled an explosion of interest in Sichuanese food in Los Angeles. The restaurant brings the region’s deep cuts into the foreground, with enough faithfulness to the originals to make a Sichuanese old-timer weep. Try the Leshan city specialty bo bo chicken, an array of skewered meats in a florally spicy chicken broth, or the spicy stir-fried pork trotters. If you’re the heat-seeking missile kind of diner, the boiled fish with rattan pepper will give you that numbing feeling you crave. It’s pretty difficult to resist the call of Shandong’s handmade wheat noodles, especially since they make them right where you can see them in their open kitchen. In this case, do believe the hype: the huge difference between pre-made and fresh noodles is well worth the extra $1. Get the noodles smothered in spicy sesame paste, served pan-fried as chow mein, or topped with their rich spicy meat sauce. Or get them all! Their Shandong beef is also a marvel, showcasing the salty-crispy cooking typical of the cuisine. Of the halal Chinese restaurants in the US, Ma’s House reigns supreme.  They do wonders with the specialties of Northern Chinese cuisine, expertly churning out flavorful beef, chicken, and lamb soups, stir-fries, and braises for their rabid following of Muslims and non-Muslims alike. Its sesame bread — imagine naan but riddled with toasty sesame seeds and stuffed with scallions or red bean paste — is a highlight, as are the chewy knife-cut noodles with aromatic lamb. This 40-year-old banquet hall set in a strip mall is home to one of the most beloved dishes in the area: the roast Peking duck, carved tableside and served with delicate pancakes, strips of scallion from the family farm, and hoisin sauce. Thin sheets of duck meat and skin are deftly separated and fanned out on a plate, so if an all-skin wrap is what you’re into, you’ll be happy here. In addition to the great duck, the place also prides itself on being a favorite of celebrities and politicians alike, with framed photos of their notable guests all over the walls. North of New Orleans, the Wong brothers are applying their Hong Kong sensibility to Louisiana ingredients, and it totally works. Operating out of their palatial restaurant, Frank and Tommy Wong serve local crawfish, pecans, gator, soft shell crab, and speckled trout when the season allows. Turns out the local ingredients fit in quite naturally with their style of cooking, making them a huge favorite in the region. The brothers are also open about adjusting the spice levels to their customers’ tastes: everything’s a little bit hotter down South. One of Boston’s best restaurants is this casual food truck-turned-restaurant started by three Chinese-American siblings. Come for the Double Awesome, their classic egg & cheese sandwich served on a scallion pancake with local greens pesto, and stay for the magical kale salad and creative array of handmade dumplings. In addition to their tasty, genre-bending food, Mei Mei is also known for their commitment to creating positive change, practicing profit sharing with their employees and holding the honor of being the first food truck in Boston to serve only locally raised and sustainable meats. 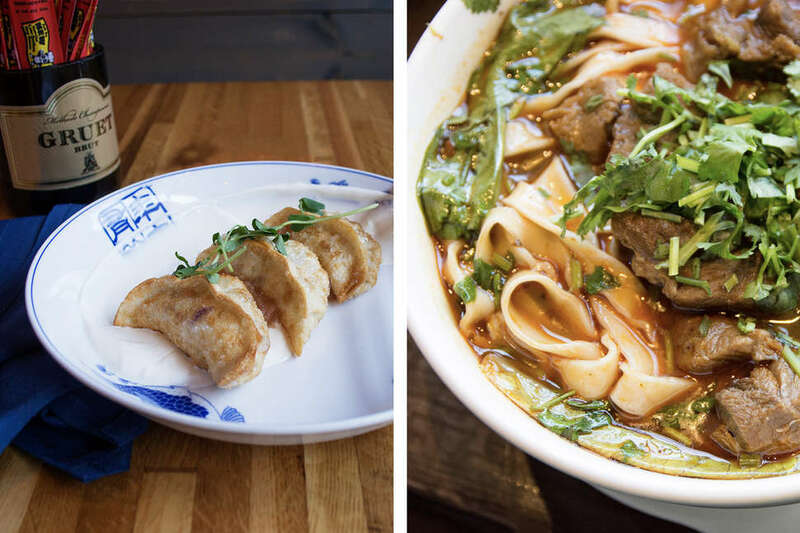 Since opening in a former pub just two years ago, Duck House has earned a legion of fans who wait faithfully in line (as Portlanders are wont to do) for their hot chili oil-soaked wontons, xiaolongbao, dan dan noodles, and cheffy takes on Panda Express stalwarts. And of course, their Peking duck is worth the hassle of calling ahead to make sure they’ve still got some available. Pair all of that with a frosty glass of local craft beer and a Timbers game and you’ve got all the makings of a very Portland-style Chinese feast. 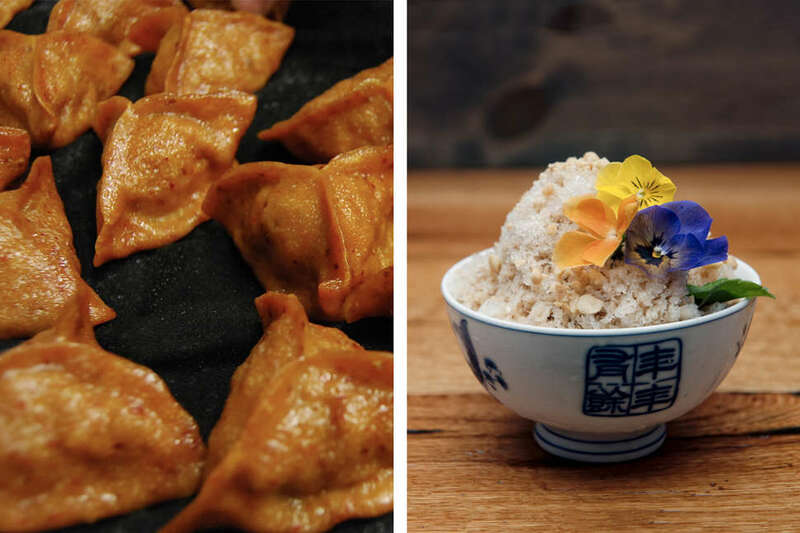 The history of Chinese American cuisine isn’t all about orange chicken and crab rangoons: there are smaller, more regional stories that are fascinating in their own right. Go to Mee Sum, located in a small town on the border of Massachusetts and Rhode Island, to experience the local, cheap eats innovation that sustained factory workers and students since WWII: the chow mein sandwich. Mee Sum’s version is widely acknowledged as the best take on this old-school dish that stretches the definition of “sandwich,” with perfectly crispy fried noodles and brown sauce served in a hamburger bun. It’s a beautiful mess and totally worth it. Sea Harbour was one of the first American dim sum emporiums that dared to push past the chicken feet and ribs paradigm, introducing a constantly shifting menu and haute aspirations to an otherwise conservative restaurant model. You can see those aspirations in every detail, from the attentive service to the leather-bound menus. And they come through in little culinary touches that bring a fresh perspective to classic dishes, like the sweet and crunchy cookie-like topping on their BBQ pork buns, and the truffle-kissed shumai. The history of the Central Asian Xinjiang province is tightly wound up with the Silk Road and the constant movement of spices, technology, and religious thought. Accordingly, the region’s food has evolved from those fortuitous meetings, characterized by spiced mutton kebabs, fermented dairy, pilafs, and long, hand-pulled noodles. Uyghur Bistro is serious about spreading the good word about the regional halal cuisine, and they pull it off extremely well. Definitely try their tender and savory polo, or rice pilaf with lamb shank and carrots, which will have you smacking your lips from the richness of the lamb, braised so close to melting. HaiDiLao, an upscale hot pot restaurant chain with origins in Sichuan Province, is notorious for its obsessive brand of service, from free snacks in the waiting room to complimentary hair ties and cell phone-shielding baggies at the tables. You get six soup bases to choose from and a whole bar full of mix-and-match condiments that you can use to make your own dipping sauce. Their selection of meat, seafood, and organic vegetable platters is among the highest quality you can get, too — from super melty Kobe beef to gorgeously arranged shellfish. The Cantonese food and cocktails at R&G Lounge are done big and bombastically, making this restaurant a favorite among Chinese business people and tourists alike. If you’re looking for the long-lost soul of San Francisco’s Chinatown, start here. Try their iconic salt-and-pepper crab, pulled fresh from the tank when you order it and fried in a light better. If you’re feeling super ravenous, call ahead to order their off-menu lo mai gai — a whole deboned fried chicken stuffed with savory glutinous rice, sweet Chinese sausage, and aromatics. It makes sense that the place for the platonic ideal of xiaolongbao lies in the Chinese food lover’s paradise of Flushing, located in the borough of Queens in New York City. For die-hard fans of Shanghainese food, this place is a compulsory first stop after touchdown at LaGuardia Airport. They come for the soup dumplings, with their juicy pork meat enrobed in a delicate steamed wrapper, their savoriness enhanced with minced ginger and just a few drops of black vinegar. Obviously get those, but wouldn’t it be lonely by itself? Might as well get an order of scallion pancakes and shenjianbao, the underrated, crispy-bottomed pork bun living in the shadow of its celebrity cousin. The King is the kind of restaurant where the wait will probably be longer than the time you actually spend eating there, but it’s all worth it for those dumplings. 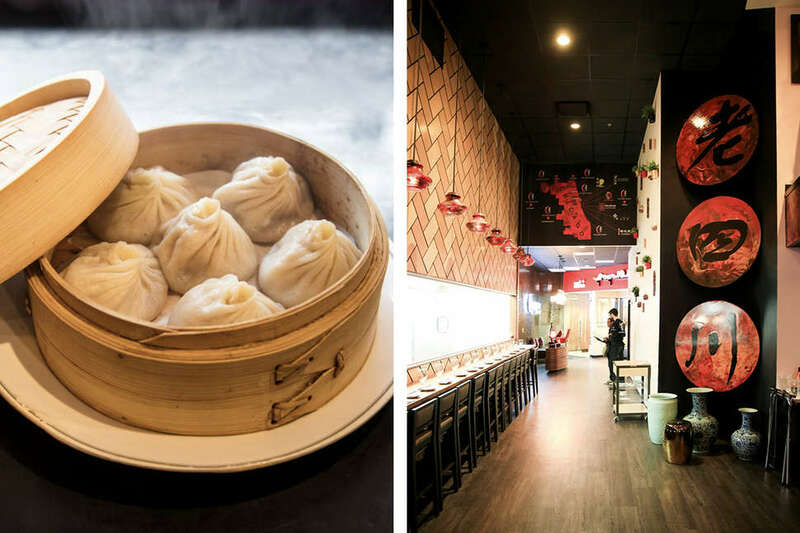 Their xiaolongbao are tastier and cheaper than what you’ll find elsewhere, and the rest of the dumpling menu, with 24 options to choose from, showcases the diversity of the genre. And don’t sleep on their vegetables dishes — their shockingly green sauteed pea sprouts and braised string beans are the perfect way to balance out the mountains of dumplings you will likely consume. 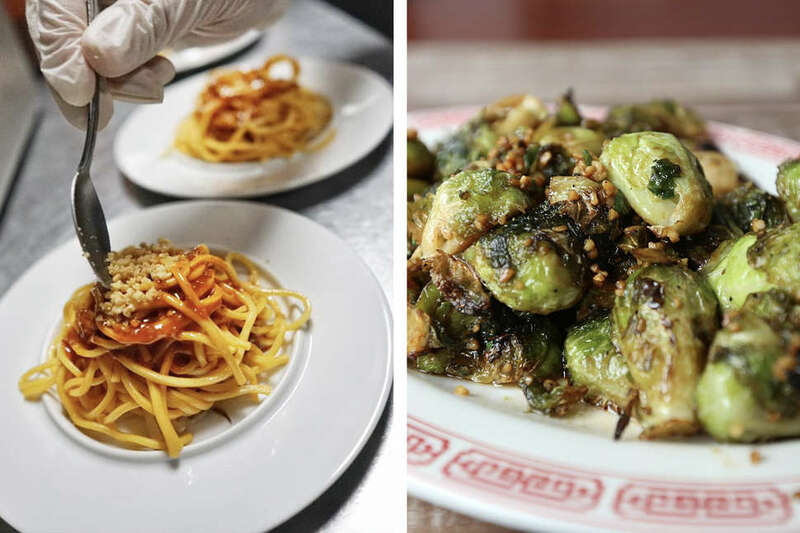 X’ian Famous Foods kicked off an obsession with Shaanxi provincial cuisine in NYC that became so strong it could sustain nine locations in the city. The making of its wide, hand-ripped noodles, which are typical of the region, is a lot of fun to watch, but it’s probably more fun to eat them after they’ve been doused with the house blend of garlic, chili oil, vinegar, and soy sauce. Getting them with oxtail is a fun option, but really, you’re gonna want them with the spicy cumin lamb. Its noodles with lamb is one of those bucket list dishes that you’ll savor long after your last bite. At this Burlington landmark, former photojournalist-turned-chef Chiuho Duval presents classic Chinese cuisine paired with a devotion to local ingredient sourcing. The menu leaps between the provinces of China and really nails its landings, especially in dishes like the mock eel (made with shiitake) and the dry-fried green beans. If you’re really in the mood to strap yourself in and let Chinese Jesus take the wheel, bring some friends along and order the nine-course family-style tasting menu. Duval, a native of Taipei, also serves extremely craveable takes on Taiwanese street food at the restaurant’s food truck. The minimalist Beijing Pie House does exactly what it says on the label. Northern China is known as wheat country, and you’ll find perfect examples of the region’s typical crackly and tender xian bing — pan-fried meat pies — here. Choose from 14 (!!!) varieties of pie, so warm and comforting that you’d want to keep them in your muffler in the wintertime. The puck-like pies are like seared xiaolongbao: full of umami-rich soup and ground meat. The best way to eat them? Take a tiny bite to let some of the hot air out, then drizzle the house-made chili oil into the vent to season the pie from the inside-out. The efficient-sounding name of this small franchise of restaurants in the San Gabriel Valley speaks to what they’re all about: humble, homestyle cooking that has nevertheless captured the hearts of many Angelenos. Here, you’ll find some shining examples of dishes from Shandong province, like hand-pulled noodle soup, fragrant Dezhou braised chicken, dumplings galore, and flatbreads, the most famous of which is the monstrous beef roll. That dish alone, a hefty portion of thin-sliced beef wrapped in a crisp-fried savory pancake with sweet bean sauce, cilantro, is worth a pit stop. Among the Eight Great Traditions of Chinese cuisine, Fujian style is known for its modesty, giving preference to the natural flavors of fresh ingredients over heavy flavor additions. Soup and broth is where Fujianese cooking truly shines. Accordingly, you’ve gotta have the soup at Shu Jiao Fu Zhou Cuisine. The fish ball soup is a regional specialty, consisting of slippery little balls of pork meat wrapped with an outer layer of fish paste in a subtle broth. But the main attractions are their smooth and succulent pork and chive dumplings, which are a serious bargain at six for $2. While New York might have gotten the lead on Shaanxi restaurant openings, LA isn’t too far behind. Xi An Tasty is the best of the West Coast crew. Perched above an Asian grocery store in the San Gabriel Valley, the restaurant serves a wonderful rendition of those famous X’ian-style wide noodles with braised meat, and the staff are more than happy to explain the menu to newbies. No matter what, don’t skip the luscious steamed eggplant and century egg with chili oil. That dish is one to savor, and you’ll wish you had something less humiliating than your bare fingers to sop up all of its leftover juice. Lao Sze Chuan, the most recognized Chinese restaurant located on the Magnificent Mile in downtown Chicago, offered Zongzi, a kind of rice dumpling on Sunday to mark traditional Chinese Dragon Boat Festival. The restaurant offered Zongzi in two tastes: the bigger ones have yolk and pork wrapped in with glutinous rice; while the smaller ones are sweet with dates and beans. In less than three hours, diners in the restaurant consumed more than 80 bigger Zongzi and more than 200 smaller ones. The restaurant also invited some diners to make Zongzi by themselves with the help of Chinese gourmets. With two bamboo leaves in hand, it takes a while for William Hennessy to learn how to fold them into a cone where glutinous rice and other fillings can be stuffed without leakage. Tying up in the final stage also took him some time, as the Zongzi he made frequently came loose. William tasted Zongzi before and participated in dragon boat race in 2017. “It’s good to learn about the (Chinese) culture,” he said. Frank admitted that he didn’t know Zongzi was made of pork and peanut and sticky rice that’s wrapped in bamboo leaves. “It’s really good combination of flavors, I really enjoyed it… It’s worth a shot,” he said. This is the first time for Lao Sze China to offer Zongzi to customers. “Chinese Americans in Chicago have marked the Dragon Boat Festival every year for years by launching Dragon Boat Race. This year, I want to tell Chinese story through Chinese food, and there is the event of Zongzi wrapping,” said Tony Hu, president of Tony Gourmet Group. More and more Americans have been to China. They are interested in China but have little knowledge of Chinese culture. “Chinese food is the easiest way for them to know China, and cut shot their distance with Chinese people,” Hu said. Hu plans to make the event an annual one. 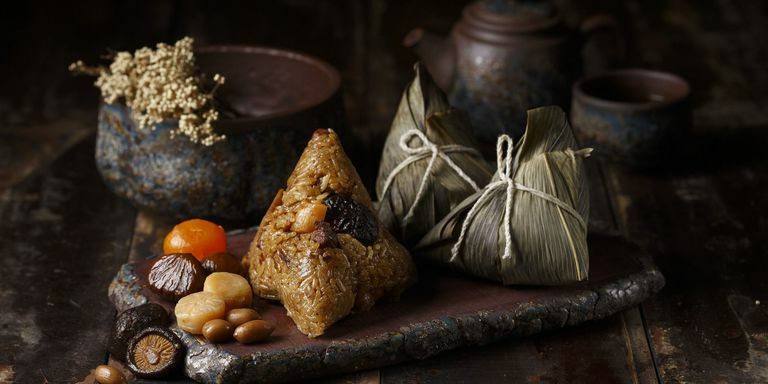 On every fifth of May on Lunar Calendar, Chinese will eat Zongzi to commemorate the death of Qu Yuan (340-278 BC), a famous Chinese poet as well as a patriotic living during the Warring States period (5th Century BC-221 BC). At our Michigan Avenue location on Chicago’s Magnificent Mile, Lao Sze Chuan is proud to introduce authentic Peking Duck, a delicacy long beloved in China since the Imperial Era and a favorite of President Richard Nixon, to an overseas audience. Celebrity Chef Tony Hu, along with Peking Duck Master Chef Tian, collaborated for over a year to perfect the Peking Duck preparation process at Lao Sze Chuan, a process lasting over three days and requiring an NSF-certified oven – the very first Peking Duck oven of this standard in America. Learn more about the craft and artistry behind our famous Peking Duck and come to savor the deliciousness for yourself at our Lao Sze Chuan on Chicago’s Magnificent Michigan Avenue.